Since we've always loved Waterton so much, we wondered what it would look like in winter. With no tourists, very few people at all, (the town has about 40 permanent year-round residents), and very few amenities. We decided to head down for a visit in January this year, one of the coldest months in the Rockies, and see what life is like in this sleepy winter town. There are no gas stations open past Pincher Creek (56km away from Waterton) - so top up as you drive through PC. There's no entertainment - the movie theatre is closed and when we were there I think the swimming pool at the Waterton Lakes Lodge was also closed. There are no church services (if that's important to you) - see the photo below. And finally, there's no shopping of any kind. If you need it, bring it! Expect to buy nothing in the town of Waterton in winter. Mabel, where did all those tourists go? Moved to Arizona for the winter! Be back in May. No cars, no bikes, no people - just lots of snow! If you need it, bring it! No groceries, no shopping - Waterton will open up again in May. What, no ice cream?? No coffee shop? And no chocolate?? Parks Canada has a good list of things to do in Waterton in winter. 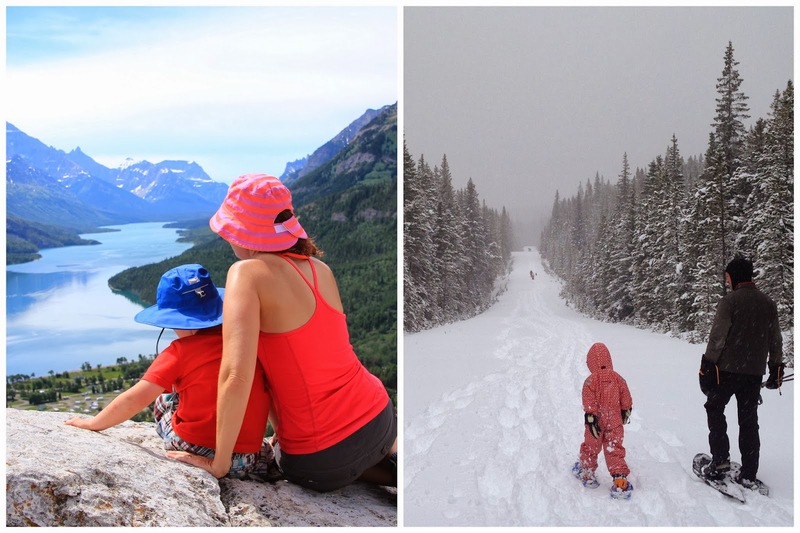 For families though, there are pretty much two main things to do in Waterton in winter; You can go cross country skiing, and you can go snowshoeing. Fortunately for us, we like both. And we are always looking for new places to explore. And on this particular trip, we just might have discovered one of the loveliest family-friendly snowshoe trails in the Canadian Rockies. It's worth going to Waterton in winter just to snowshoe to Crandell Lake from the Akamina Parkway! While, snow like this is great for alpine touring, it's hard for people on skinny skis - or for kids learning to ski; My son definitely needs grooming and tracks. Without that, we need to snowshoe. Thank God we had brought snowshoes. 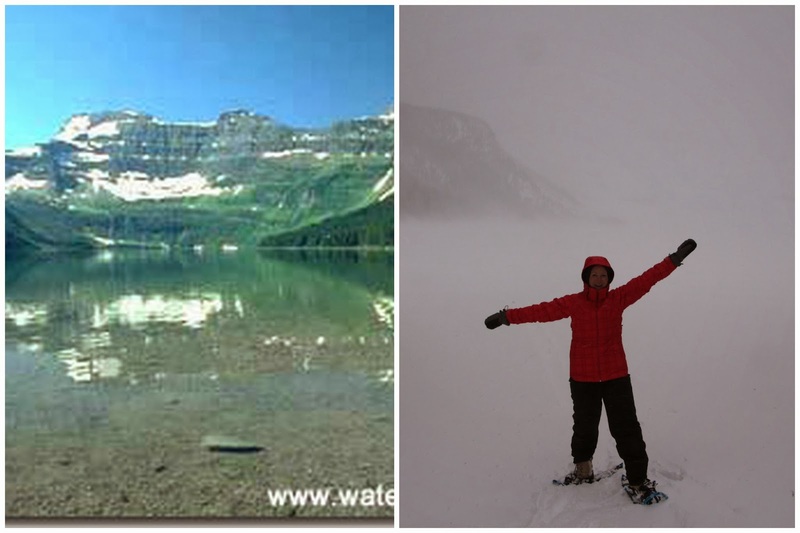 Cameron Lake is one of the main tourist attractions in Waterton in summer so we were very eager to see it in winter. It's an easy 5km round trip hike or ski to Cameron Lake from the Little Prairie Picnic Shelter on the Akamina Parkway and there's little height gain. In summer you would normally drive right up to the lake so you'll be skiing or snowshoeing on the closed road for the last 2.5 kilometres to reach the lake. For more information on the trip, check out the Waterton Park Website. As you can see from my collage above, we didn't have the best day to see the lake. It was actually hard to tell there was a lake at all! Which, was a huge disappointment after hiking the 2.5km to get there through wind gusts that reached 80km/hour during our visit. My son hates wind with a vehement passion so he was less than thrilled by the hike. Would I return to ski or snowshoe to Cameron Lake? I'd have to say no. The weather is too variable in winter and the trip isn't worth it if you have no views. You spend the whole time hiking a boring road (let's be honest, who likes skiing or hiking a road?) and if you don't see anything pretty at the end or enjoy the journey is there a point? If I happened to be in Waterton on a beautiful clear winter day and the road was tracked, I would definitely ski it to the lake. Snowshoe - meh. Probably not. Now, this is the trail you go to Waterton for in winter. This is the trip you plan to repeat. It's a fabulous snowshoe destination and also popular with backcountry skiers. We obviously chose to snowshoe it with our son. We had fresh powder and Noah wanted to break trail much of the way. The trail was easy at 2.4km return from the Akamina Parkway and elevation gain was under 200m. A trip the whole family can do! What I liked most about this trail was that it was a real hiking trail as opposed to a road I could drive in summer. We hiked through trees with occasional scenic views to the surrounding mountains. Little dips and rolling hills on the trail provided interest, and we had something scenic at the half way point. The way down was quick and easy because we had promised Noah he could ride in the sled down if he hiked up by himself. Always bring a sled! Would I snowshoe to Crandell Lake again - Heck ya! And return to Waterton just for the hike - yes. I'd also consider doing the trip on light touring skis. That would be a lot of fun in good conditions. I'd like to say thank you to the Waterton Glacier Suites for putting our family up for the two nights we were in Waterton. There are few options for accommodations in winter in Waterton so we were very fortunate to have a warm cozy place to spend our time. We had a one bedroom suite which worked very well for us. Noah slept on the pull out couch in the main room while we enjoyed our large bedroom with fireplace in the back. The room was basic with no kitchen beyond a small fridge and coffee maker but we enjoyed complimentary breakfast each day in the hotel's cafe, located in their front lobby. We enjoyed dinner in the evening at the hotel's cafe as well and Noah was thrilled that they had lasagne on the menu. More thanks go out to the staff of the Waterton Glacier Suites as well! If you want to see hard working staff, you have got to see these guys in action! The lady on duty was there when we arrived late to show us into our room, was there when we had a problem around midnight with noise from the next room, was still there at breakfast the next morning, serving and cooking for us, and then was there again for dinner that night, serving and cooking again! The next day, yep, still there at breakfast. WOW! I honestly don't know if she slept all weekend. Finally, without the incredible support I received from Parks Canada, this trip would not have been possible. Thanks Christy! For more information on Winter in Waterton, visit the Parks Canada website for comprehensive information. And, definitely consider visiting for Waterton's family-friendly Winter Fest this coming March. That's too bad Waterton is no longer a four season destination! I know this place can be hit or miss in the winter. I attended the Winterfest over the Family Day Long Weekend in Feb 2012 and it was perfect in every way. The town was packed and alive and there was not a room to be had for a night. It was booked solid. Lucky me, I scored three nights at the Glacier Suites. I wonder why they changed it to March. I hope it will be just as successful. Waterton Lakes Lodge is now open for the winter along with their restaurant Vimy's. I went to Waterton for a day of photography Feb 26, 2011 and the town was dead. It was not the place to be (roads not plowed, could not get around) when the festival is not on and I wonder if now that it is no longer a four season destination, will people stay away. I was hoping to go down for a weekend real soon but I am not thinking maybe not. I have to say that I agree with you Alexandra. I like towns to be quiet in Winter but Waterton was a bit too quiet for me. I would definitely go back again if they were having a winter festival to see what things are like. Great to read this post and it's really helpful one to read. it contains astounding info for traveling. thanks for sharing this post.